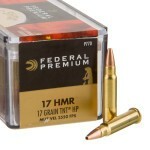 .17 HMR ammo uses a notably light 17 grain (sometimes 20 grain) bullet and produces high muzzle velocities in excess of 2,500 feet per second. 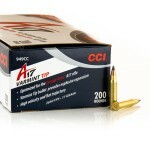 This results in flat trajectories and rapid fragmentation, which kills varmints with great efficiency and minimizes the risk of ricochets or overpenetration occurring. 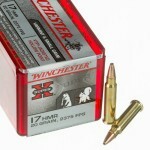 Bullets for this caliber follow the spitzer profile, with a polymer tip that provides excellent external ballistics and initiates lethal expansion. 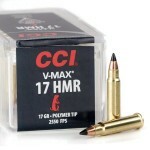 The .17 HMR performs better at medium range than most of its rimfire competitors, though long range effectiveness suffers somewhat due to the light projectile's vulnerability to crosswinds. 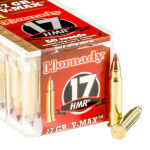 Unsurprisingly, Hornady is a leading manufacturer of ammo in this caliber; however, high quality offerings can also be had for varmint shooting from other manufacturers. 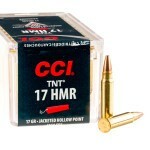 These include CCI's TNT and Gamepoint series, Winchester's Varmint line, and Remington Accutips. 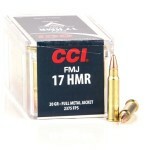 All of these loads achieve excellent results by combining hollow point bullets with the high velocity inherent to this caliber. 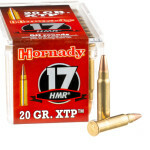 This cartridge should not be confused with the .17 Hornady Mach 2, with which it is not interchangeable. 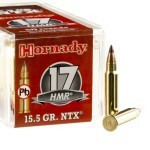 The .17 HMR is more powerful but also longer than the HM2, which is designed to fit in .22 LR firearm designs with only a barrel change. 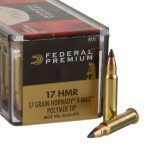 Get great bulk rounds for rimfire plinking today with our best bulk 17 HMR ammo. 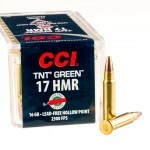 This is a look at some of the most popular 17 HMR that's in-stock and ready to ship today! 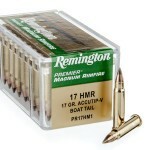 Take a look and load up on cheap rounds for your next range trip now.